If we had to pick one icon that characterizes the grace and style of the elegant 1920’s and 1930’s it has to be the cocktail shaker. Gleaming with sophistication and panache these cultural artifacts are one of today’s most valued collectibles. 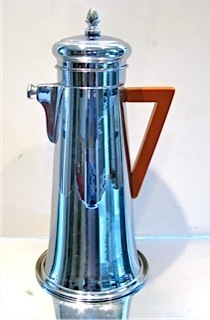 The Forman Brothers cocktail shaker is sought out by serious bar ware collectors and Art Deco collectors as well as antique dealers. This cocktail shaker was included in a series of seven museum shows, Shaken, Not Stirred: Cocktail Shakers and Design, which traveled the Country in the late 1990s’. Venues included; The Montgomery Museum Of Fine Arts, Milwaukee Art Museum, The Museum Of Our National Heritage, and the Louisiana State Museum, at Jackson Square, New Orleans. What follows then is the background and history of this interesting icon and its designer and maker Sol Forman. Sol Forman,- 1903-2001-, designed and patented a classic chrome geometric Art Deco cocktail shaker. -Des.98,855- His company Forman Brothers produced this in a variety of styles; in hammer tone, less the handle, with a Catalin handle, and with a Catalin finial. What’s not shown on the patent copy and one of the outstanding features of this shaker is the embossed bottom with fourteen cocktail recipes! 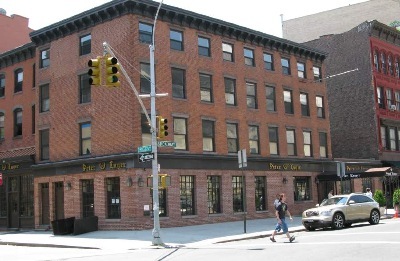 In 1920, at the age of 17, Sol joined forces with his brother and sister to start a small metal ware business in Brooklyn called Forman Brothers. Successful right from the start, they soon had a large factory in the shadow of the Williamsburg Bridge. Sol Forman was a prolific designer with close to a dozen patents to his name besides the cocktail shaker. There are pitchers, a cocktail glass with metal stem and glass insert, butter dishes, relish tray, and in 1931a drip coffee pot that used paper filters (#1,792,218). The base of the coffee pot was by Hall China Company and Forman Brothers had an exclusive contract with them to produce this coffee pot and also dishes and platters that would be set into chrome plated metal frames. There were many cases that Sol did not apply for a design patent and just went into production with his designs. They produced stamped metal gift ware and serving ware for hotels, restaurants and the home using the new chromium plating process; teapots, plates, trays, sugar and creamer sets, and the like. Sol Forman changed the company name from Forman Brothers to Forman Family when his brother left sometime after 1938 to start a tool & die business. 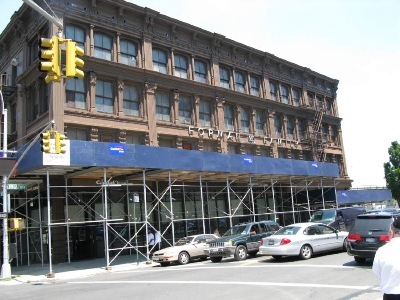 Forman Family took up a large four story cast iron building. Raw sheets of material would be delivered to the basement receiving dock, to be cut to size to fit into the large stamping and forming dies that were set into 60 ton and 100 ton presses that sat on the cement floor. Next parts would move up to the first floor for finishing operations, then to the second floor for plating in chrome or anodizing. 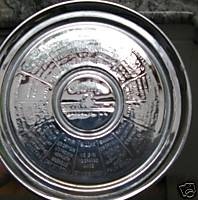 When aluminum ware became the fad in the 1950’s Sol was right there designing and manufacturing serving trays, broiling platters, dishes and the like. Sol Forman excelled at sales and frequently entertained customers across the street at a local steak house, opened in 1887 by a German immigrant. With a growing business, many days, this meant eating two lunches a day, and when a trade show was in town sometimes three. As this part of Brooklyn went into an industrial decline in the late 1940’s with breweries and other nearby manufacturers closing up, the local steak house became the one lonely bright spot in the now quiet industrial area. And as the Hasidim began to make up an increasing share of Williamsburg’s population business began to slow for the steak house. Kosher laws permit Hasidim to eat only the forequarters and not the beef hindquarters from which the restaurant cuts its steaks. And nevertheless the steak house was not kosher. Add to this the fact that the owner’s son who was now running the business did not use a weight-in scale for meat deliveries, not a good practice in this business. The steak house closed and went out of business in 1950. In the mean time the Forman Family business was doing well, and where would Sol take his buyers for lunch? There was only one answer for Sol Forman. He purchased the closed restaurant at auction for the price of the land. He was the only one to show up that day for the sale. The family would retain the steak house name, Peter Luger’s, and the scrubbed oak tables, chairs, bar, and back bar that had been in the restaurant since it opened; they would do just fine, and are still there to this day. Sol appointed his wife as buyer for the business, hiring a retired meat inspector, Joe Dowd, to show her the ropes. Marsha Forman and Dowd went to the meat district twice a week, for the next two years, to make choices and stamp them “Peter Luger”. Marsha retired at the age of 80 and passed on in 1998 after 61 years of marriage. Sol Forman had three daughters, Elissa Cullman who is not involved in the business, Amy Rubenstein and Marilyn Spiera who oversee operations and are on the job every day. Marilyn Spiera took over the job of meat buying using the knowledge learned from her mother and used the same original stamp to ink mark her selections. Today Marilyn has passed the torch; well, make that the meat stamp to her own daughter Jody Spiera Storch who started to accompany her grandmother and mother to the meat district when she was 8 years old and is now in charge of selecting the meat for Peter Luger’s. The Forman Family metal stamping business went into decline and out of business in the mid 1970’s at about the same time as the great International Silver Company in Meriden Conn. One of the chief reasons being, besides the economic slump of the time, was the imports of foreign competition selling at prices lower that their raw material price. No matter; the Steak house was doing fine and some employees that ran machinery just started a new occupation across the street. Today even its biggest Manhattan competitors admit that Peter Luger puts out the best porterhouse in the world, sliced on a tilted plate, and served by a waiter with no time for chitchat. Peter Luger has been named the best steakhouse in New York City by Zagat Survey for 24 years in a row. Indeed, the cult status of Peter Luger is such that it has, for decades, been the toughest reservation to get in New York; a wait of two or more weeks in not unusual. The upside is free parking in the empty factory lot across the street. Even into old age Sol loved and cared for his steak house creation, He went to the restaurant every day and called each night to check receipts. Sol Forman passed on in November of 2001, at the age of 98. A great success on many levels he is remembered; as a young man who dropped out of school to work and support his elderly and sick parents, as a young entrepreneur who without a formal education became a designer, inventor, holder of close to a dozen patents, and owner of a prosperous metalware facility, and one of the most famous restaurateurs in the World, and most of all as a kind and loving man who love and cared for his wife and family above all else. He showed that a man happy in his work can just about live forever. His is indeed a wonderful story. He leaves behind a large loving family, thousands of friends and customers, and as long as the restaurant continues even into the next century and beyond the name of Sol Forman will live on. His magnificently designed Art Deco cocktail shaker will live even longer in museums and collections World wide. PETER LUGER'S ACROSS THE STREET.